Computer power supply units (PSUs) or SMPS (Switch-mode Power Supply) are often overlooked when choosing components for building a new PC or upgrading an existing system. But a low quality PSU is just as likely to cause your PC to crash or behave erratically as buggy drivers or faulty hardware. SMPS or Power Supply forms the most important part of the computer and a good quality SMPS can enhance the performance and life of your PC components whereas a local branded or cheap SMPS can damage your components and can crash your PC. Here are the topmost computer power supply brands or companies. Antec is an American company that makes Personal computer (PC) components and accessories. Its main products are the computer cabinets and power supplies (SMPS). It is known for its outstanding quality products. Antec offers a wide range of cases, such as its advanced Performance One Series, economical New Solution Series and VERIS family of media components designed for the home theater PC market. 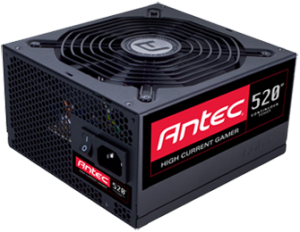 Antec’s products also include front line power supplies, such as its premium Signature Series, powerful TruePower Quattro Series and EarthWatts, one of the most environmentally friendly power supplies available. PC gamers are an increasingly significant consumer of performance components, and many Antec products are designed for the gaming demographic, like the premier gamer enclosure: the Nine Hundred. Antec also offers a line of computer accessories comprising many original products, including its patented LED fans and notebook cooling solutions. Their products are comparatively expensive than of other companies. Cooler Master is a computer hardware manufacturing company from Taiwan. Their main products are computer chassis (Cabinets), PSU (SMPS), coolers, cooling pads, and other accessories. Their Power Supplies or SMPS are also of top notch quality but are relatively cheaper than Antec. If you want an affordable good quality product then look no further than Cooler Master. VIP range of Power Supplies are manufactured under Kunhar Peripherals Pvt Ltd, an Indian company. Their range of SMPS are cheapest among the good brands but they do not compromise on quality. Their SMPS are good on performance but are relatively difficult to find. If you are on budget then VIP power supplies will suit you. Corsair is a computer peripherals and hardware company. Their range of products include high-speed DRAM modules, ATX power supplies (PSUs), USB flash drives (UFDs), memory and case cooling solutions, computer cases, solid-state drives (SSDs), and speakers. They offer quality range of Power Supplies that delivers stable and reliable power to your PC with a focus on energy efficiency and ease of installation. Tagan is a company from Taiwan that only manufactures SMPS. Their SMPS are very expensive but are known for Rock Solid Performance. If you have extra cash and want the best power supply then go for Tagan PSU. Pls find my SMPS specification as you have asked. When I am booting again , there is 4 to 5 beeps followed by warning message “Processor thermal heat” . Could you kindly suggest that changing of smps will fix my problem? The 12V rail current is too low (14A) for your Qori SMPS which is very dangerous. Also i have never heard of this cheap smps brand. For your configuration the 12V rail current should be more than 25A. I think the problems your are facing is because of this low quality and crappy smps. I strongly suggest you to buy a good branded smps like Corsair VS450 450W or Cooler Master Thunder 450W or Antec VP450P I 450 Watts. You can check this link https://www.akshatblog.com/how-to-find-a-good-smps-for-your-pc/ where you can buy them as there is good discount available on them right now. All these SMPS are of very good quality and have more 30A current on 12V rail, so you will be more than fine with them and you don’t have to worry about it any more. You can choose any one from the three smps as they all are good. I have sent you the gtalk request. Kindly accept that. Please check it and give me a reply whether it is caused by SMPS. Definitely it is a issue with your SMPS as you are using Zebronics Gold 450W SMPS which is a total crap, as it has only 16A current on 12V rail which is not enough for your or any configuration. So i advise you to change your SMPS ASAP and buy either Corsair VS450 SMPS or VIP 500W SMPS or Cooler Master Thunder 450W SMPS. I changed it with Corsair VS450 SMPS.and tried. It never turned off or get hanged. But only once the temperature spiked to 65 degree and i got the message that it was too hot. Just today bought the new Corsair VS450 and installed. at Idle or when playing games? It was while playing a video. and temp automatically got reduced. I have bought Corsair VS450. Now no problem. Check the last comment.. Is it true ?? Not true and i am wondering why he was so mad at corsair vs series. 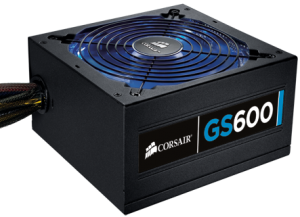 Corsair VS power supplies are of very good quality, tested and used by many gaming enthusiast. I had iBall LPE223-400 which shorted due to power fluctuation. Could you please recommend a compatible smps in place of it. I dont have a graphic card in my pc. 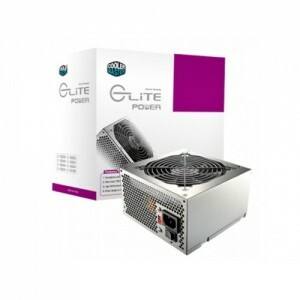 I would recommend you to go for either VIP 400 Watt or Cooler Master Elite Power 350W SMPS. And if you are planning to add a graphics card in near future then i would advise you to go for Corsair VS450 SMPS. i will not have any graphic card as on board graphics is all that i want. I have the perfect thing you but it is a bit costly. You should get Corsair CS450M SMPS. It is a 450 Watt PSU and slightly above your requirement but i think it will not be any problem. It has good 35.5A current on 12V Rail, has 80 Plus Gold Certification and is Modular. Thanks Akshat , i will do some research on this one and decide. Well, now i am having an SMPS issue. The old SMPS (Prime Source ” China Make” ) Model No: PST-XS400FA have failed and trying to replace with a good quality SMPS. Now i am confused what will be the best SMPS for my system configuration. I am an heavy gamer. Which one will be more suitable. I can spend Rs. 5000 – 6000 Max. for a superior quality SMPS if it is worth spending. Please advice me a good one. correct me if my choices are wrong. Thank you sir. You are doing a great job. Can you provide your expertise on Circle SMPS when compared to Corsair, Antec, VIP etc. Your views & reply awaited asap. I need your help.I am planning to buy AMD RADEON R7 260X which consumes a good amount of power.I have an Iball lps223-400 watt smps and I am planning to buy corsair vs550.But I have found that this smps has active power factor correction and I have understood that I have to buy another ups costing 4000 rs but my budget is limited.So sir can you please suggest me an smps that does not have active power factor correction and which works in my 606va ups. Today All the good branded power supplies comes with Active PFC as it improves the efficiency of the SMPS. It is recommended to use pure sine wave UPS with Active PFC Power Supplies but i have seen many users using it with normal UPS also and are having no problems. Also please tell me your UPS model. Thank you very much for your fast reply.My ups model is POWERCOM IND606a.Is it sure that corsair vs550 will work in my ups without any problem.Can you also tell me whether my ups will support this 550 watt smps or should I go for vs450. I think you should be fine with Corsair VS550 with your current Powercom UPS. I would advise you to go for Corsair VS450 for your PC. I recently brought some pc component online for making gaming PC . But i don’t no which type of smps use with all this hardware? And know me of which Brand. I would advise you to get Antec VP550P for your system. It will cost at around Rs. 4.2k to 4.5k approx. which cabinet is good for me. Cooler Master Elite 311 is good or any other cabinet of your choice that is tall & wide enough and has plenty of room for airflow. Well, my issue is with cpu or smps fan having getting rotate very faster which makes lot of noise while working on applications even if open multiple chrome browsers. I The old SMPS I am using is Zebronics so can you suggest with a good quality SMPS. Now i am confused what will be the issue on my pc is this because of SMPS for my system. I will watching lot of hd (1080p) movies and browsing. Zebronics SMPS are very poor and they cause one or more problems for your Computer. I advise you to change your SMPS to Corsair VS450 / VIP 400W Gold or Cooler Master Thunder 450W. You can inspect the noise by opening your cabinet cover and then switching ON the computer and see what is causing it, Also clean your CPU and Graphics card Fan by using a brush and small vacuum cleaner as dust and dirt accumulates on the fan over the time. For cabinet you can go for any cabinet that is wide and tall enough for proper airflow and room for your components. I want to build a small file server with about 4 Hard Drives (1 for the OS) running open source NAS OS “Open Media Vault”. The motherboard will be a low range server board which is still to be decided. I have a cabinet Corsair 200R. I request you to kindly suggest me a suitable SMPS for this server. I would suggest you to go for Antec VP450P SMPS. It is an excellent high quality power supply from the great Antec brand, and it will keep your server running continuously without any issues. It will cost you at around Rs. 3k. How to chk tht my colorsit 450wt smps output power & Which volts is gud fr my pc. last few days my pc creat a problm . during a run pc. hdd should be lost detection. Aftr restrt take more tym in boot pls suggst me ..
You can check your SMPS voltage and current ratings on a chart printed on the SMPS itself. Here look for current on 12V Rail because it is the most important thing for a SMPS. For a modern day PC with graphics card the current on 12V rail should be at least 30A. Always use good quality branded SMPS, and I would advise you to get Corsair VS550 SMPS. or apple mac mini ?? You should go for Corsair VS450 SMPS. I was using Zebronics gold 450 w smps, I don’t know that was a local one. You will know it better when you install the new SMPS as it impossible to tell just by looking at the components. Damage may or may not happen. So first get the SMPS i have suggested and then get back to me if there is any problem. Is mercury smps are good to support g41 motherboard with dual core processor and 2 hdds? Which is better SMPS for my PC, i want to buy SMPS under 1000/- Rs. if surge protector is enough which is good brand in india ? if i want to buy ups which brand is good in india? plz quick reply? Use both i.e. surge protector and UPS. for surge protector you can ask your local shopkeeper to give you a good one as there are many small brands available for it. And for UPS go for APC 600VA UPS. apc service centre is there in india ? what about warranty for that product? because i m planning to buy vguard ups is it ok ? APC do have service centers in India. If you are planning to buy v-guard then also it is ok.
Go to your modem settings by typing in 192.168.1.1 and use username and password as admin. Now go to->advanced settings->device info->arp . Here you will see the IP and MAC addresses of the devices connected to your modem. Nvidia gtx 970 4gb, i5 4690k, asus z97a mb, 600w and cabinet antec, corsair 8gb ram, hdd 2 gb seagate or wd.. any suggestions?? I mean is the config right.. also is it better if I buy an i56600k over 4690k? Also which mb would support 6600k? And does it support ddr3 rams? Not much of a performance gain but it better to get new generation hardware to be more future proof so get i5-6600k. For motherboard i would suggest Asus B150M-A D3 which is also compatible with DDR3 RAM. As of now I have no plan to buy Graphic card but I will be buying that next year sometime in second half. 1. What should the SMPS for above Rig (Including future possibility of Graphic Card)? Try http://www.mywifirouter.me and see if it is working. 6. I do not plan to use a GRAPHICS or a VIDEO CARD. 1. Is it better to use a single 4GB RAM or 2x2GB RAM. Also what is the difference between a 1333 Hz and a 1600 Hz RAM? 2. What SMPS to use here? What is the approx wattage for this configuration? A friend suggested to me that this configuration is too high, he further suggested that I go for a GIGABYTE H81M-WW motherboard(4th generation). Now I like the H97M-D3H motherboard. But is it a waste of money? I am not into gaming etc. I just want a fast system. 1. It is better to use a single large module of RAM, 4GB in your case because you will be left with some room for RAM up-gradation. The difference between 1333 Hz and a 1600 Hz RAM is that later one is 333 MHz faster which can improve your performance in gaming only. So I will go for a single stick of 4GB 1333 Hz RAM and the CORSAIR VS 450 Watts SMPS power supply. Regarding the motherboards, if I understand correctly, the H97M-D3H will also be an overkill just like the H81M-WW. I had originally intended to purchase the H97M-D3H as some sites say that BIOS updation can become an issue in the 4th generation motherboards. How difficult is it to do that if it becomes a necessity? Why is that a higher specification motherboard H81M-WW costs Rs Rs 4129 and the ASUS-H81M-V3 costs Rs 5144 almost a thousand rupees higher? I can afford the price, that is not the problem. Do different specification motherboards draw more current from the PSU in the 12 Volts rail assuming that a single RAM is used and there is no graphics card. The processor here is a CORE i3-4160 which I have already purchased. I am yet to purchase the motherboard. There is not much difference between ASUS-H81M-V3 and GA-H81M-WW motherboards. You can go with anyone of the two. Also the price can vary from manufacturer to manufacturer as there are many factors involved like quality of components, testing etc. Motherboards with nearly same specifications and size draws nearly the same current. Bigger Full ATX and Gaming motherboards require more current to operate. i want to build my own assumble desktop..
is smps connect with motherboard ? Yes Antec BP450PS is fine for your system and motherboard. then how it connect with smps? You do not need 650W SMPS for your configuration and it is better to go for Antec then Corsair. There is no problem in going higher Wattage SMPS but it will cost you more money without any real benefit. What is so confusing? Make it clear. Also tell me the budget you have for SMPS ? This will enable me to give you the best device for your money. Both are good i would rate Corsair a little higher. If Corsair means 2400 mhz or 1866 mhz which one is best . Corsair as it has higher frequency. Looks Good. Go for it. And if you are going to buy a monitor then go for at least 22-inches. You are welcome and if possible please promote this blog among your friends as they can also take advantage of it. Good wishes for your new system. P100 is a very good cabinet. Do not worry and just go for it. your blog is very useful.Appreciated. Originally my pc is compaq presario which comes with hipro 250w (12v-14A) SMPS and i upgraded my pc without changing cabinet and smps. i have issues that system starts only 4 to 6 min in morning(i.e if system powered off for long time) later works normally. System starts normally.with this smps i have issues with Tv Tv tuner card.video has some lines and waves moving which is acceptable but i need clear video. when i tried with my old hipro 250w (12v-14A) SMPS (which is 10 yr old) ,tv tuner card plays video clear video but have starting issue. I am not gamer.i used to play 1080p( higher bitrate) videos and surfing. So please suggest me good smps. Also what is dual rail .how it differs from single rail. which one is better? also Is it ok VIP400r plus(20A) has less 12v rail than Umax (25A)? Antec is one of the best brands in SMPS and PC cabinets. Antec VP450P is definitely better than Corsair VS450, but in general Antec power supplies cost a bit more. But there is a good discount available on Antec VP450P here http://www.amazon.in/Antec-VP450P-450W-Power-Supply/dp/B006TM8XPW/?tag=aksha0b-21. For detailed info on dual rail and single rail please refer https://www.akshatblog.com/single-vs-multiple-12v-rail-smps-psu-comparison/. And for last i don’t trust Umax SMPS but VIP power supplies have better quality as compared to Umax. Nice choice and feel free to ask if you have more queries. is this psu capable of handling i7 6th generation ddr 4- 8gb system with nvidia 2gb graphics card . i plan to upgrade my pc (mostly 5-6 months)? if i upgrade my Ram to 6gb,will performance increase ? thats why plan to upgrade to 6gb.will increasing RAM help me? Yes Antec VP450 can handle i7 6th generation processors along with a mid-range graphics card. You buffering problems is due to your CPU which is very under-powered for higher bitrate HD videos and there is no point in increasing the RAM for your older system which i think has sufficient RAM i.e. 4GB. Is 2GB GT730	DDR5 ok for antec vp 450p? what is needed to boost the performance for my present config? It is more than enough for GT 730. For GT 730 i would advise you get the Zotac one at here http://www.amazon.in/ZOTAC-NVIDIA-DDR5-Graphics-Card/dp/B00L61VGPU?tag=aksha0b-21. I meant that your processor is quite weak and you need to get a better processor, preferably i5 or i7 to get maximum performance. so it is better go for system upgrade rather than RAM.Ordered VP450P.So that if i upgrade my pc to i7 i can use this.Thank you for your timely help.Appreciated. Yes it is better to go for system upgrade instead of wasting money on older PC. Antec VP450P is enough for i7 based system so don’t worry. And last i have some request, if you like this blog then please spread the word to your friends and others. Sure.You are doing great job.Like your Enthusiasm .Keep it up. Thanks for the appreciation and keep asking and visiting. I want to build a NAS server with 6 1 TB HDDS. One HDD will be used for OS. Suggest me a suitable power supply. Will Corsair vs450 serve the purpose? Thanks for the reply. It would be nice if you can suggest a model of Corsair because it is easily available locally. The local vendors are of opinion that Antec is not properly supported locally. Secondly, will corsair vs450 support seven HDDS and other stuff on my motherboard? I would still advise you to get Antec only because of its reliability, performance and pricing. You can buy Antec online without any issues. Antec has decent support in India if not the best. Seven HDDs for Corsair VS450 will be an overkill and higher models of Corsair will be expensive. How much budget you have for SMPS? Thanks for the prompt reply Akshat. Budget in not the constraint for my server. Will Antec VP450P support 7 HDDs. Also for lower number of HDDs what model would you suggest? Antec VP450P can handle 7 HDDs but if budget is not a constraint then you go for higher model of Antec which is Antec VP550P if you plan to add more things in future. here is the link for it http://www.amazon.in/Antec-VP550P-550-Watts-PSU/dp/B00565RGQA/?tag=aksha0b-21. And for last i would not recommend any model below 450W for your requirements. Somebody has told me that for 7 HDDs I will require more watt power supply above 600Watts. Will I require even higher watt model than Antec VP550P, which I believe is of 550 Watts? Which is equivalet Corsair Model of Antec VP550P? Just incase I want to purchase is locally. Antec VP550P can handle 7 HDDs very well. For SMPS it is not all about the wattage but the amount of current on 12V rail and the SMPS construction quality and components used. For its equivalent in Corsair i would suggest Corsair CX600 V2. I have already having a corsair vs430. Can it run 24 x 7 with fewer HDDs say 4? Got ANTEC VP450P yesterday. works like a charm.But it comes with 2 pin plug point there is no pin for earth.but it have hole for the earth in the plug point .do it cause any problem or i use old cable ? You can use any cable and it will work fine with both. The fan should be facing downwards towards the board. i fit in the downward direction only.without earth its not good for cpu right?do i need to bought something to fill the holes in Antec plug point cable to get earth ? Now i am using DDR2 Dynet 800mhz 2gb +dynet 667mhz 2gb.due to backward compatibility both rams working in 667mhz only.Do replacing 667 with 800 dynet give more performance ?or i replace both with 800mhz trancend ddr2? which brand RAM has better quality? Also do my motherboard nvidia geforce 7050/610i motherboard supports 800mhz? please do not do such thing. Use the old cable if earthing is an issue. You won’t notice any performance increase by replacing 667 Mhz with 800 Mhz RAM. Transcend and Kingston are both good so you can choose any one. For motherboard please specify the full model of your motherboard. do replacing transcend or kingston with dynet show some increase in performance.Also i had some freezing issue after system used some time.i checked with windows memory diagnostic which results in no error .OS(windows 10 64bit) also formatted .so i think RAM got issue.Is it correct? or some other issues. Also using 800mhz +667mhz don’t cause any problems? Regarding Motherboard this is the thing i got .what info you needed? If you are getting BSOD (Blue screen of death) then it might be a RAM issue. Dynet is not a good RAM. Using 800 MHz and 667MHz does not cause any problems given that they are of same manufacturer and type. You motherboard model will be given on your motherboard manual or box packaging. Can I run a File Server on Corsair VS 430 with 4-5 HDDs on a 24 x 7. Can I run Open Source Firewall on Corsair VS 350 with a Single HDD and a couple of LAN cards? file server on Corsair CX430 with 4-5 HDDs is a bit on danger side, on the other hand you can run one HDD on VS350 with LAN cards. Kindly also tell me which is better Corsair CX 430 or Corsair VS 3350? In general what is the difference between CX and VS models of Corsair? i got BSOD rarely.today after bios when windows loading got BSOD continuously.After removing and reinserting RAM helps me to log in.So i think issues with RAM. My motherboard zebronics nvidia nf-7050 motherboard nvidia geforce 7050 / nforce 610i 256mb onboard graphics. Frankly your motherboard is quite old and outdated and it does not support 800 MHz RAM. If you add 800 Mhz RAM on it then it will run at 667 MHz only. yes its old i think its 2009-2010 model. Thats why plan to upgrade my pc in near future.For immediate use ,i need good working system.So i have to change my ram to transcend with 667 or 800mhz. Does overclocking my cpu along with new RAM can boost performance? i read your blog about overclocking for GPU.Also Please provide good tutorial for overclocking CPU also . Overclocking a CPU can boost some performance and i will surely provide a tutorial on CPU overclocking too. Which processor you currently have? as each processor has different overclocking potential. pretty weak processor and it has got only 1MB cache. I think overclocking it will not give you much improvement. Oh k k .Then i should change my RAMS to Transcend and wait for the system upgrade.Thank you very much .your blog is very useful. Thanks for the ever prompt reply. 1. Which Corsair model will you suggest me for running my NAS server with 5 HDDs? As suggested above, I think it would be Corsair CX 600 V2. 2. Will Corsair CX 500 serve the purpose too? 3. As I already have Corsair CX 430, how many HDDs can it support, if I want to run my server 24 x 7? 4. I will use an existing Corsair VS 350 for Firewall Server. Can I run my server with a single HDD for 24 x 7 using this SMPS? 5. As suggested by you, I will try to purchase Antec SMPS (Antec VP450P) from local market. I think it will support 5 HDDs. Right? I will do precisely as listed above. I want to know the best Power Supply for a normal Desktop PC The Desktop does not even contain Graphics Card but should be durable and should run long time. How much is your budget and what is your desktop configuration ? Configuration is Core 2 Duo PC with single HDD. RAM is 4GB. Nothing else. Not even optical drive. Budget is not a constraint. But brand should be available in Indore city. Then for this configuration the cheapest branded SMPS i can think of is Cooler Master CM350 Plus. It cost around 2.2k. But cant I get Corsair VS350 in the same price bracket? Corsair brand I suppose is better than Cooler Master. What do you say? Both are good brands and if you get VS350 then also it is fine. I dont have budgetary constraint but anything cheaper which will server the purpose? What about Circle brand SMPS? Yes cheaper ones can serve the purpose but it should be good. Don’t ever think of Circle. In cheap and good SMPS i recommend VIP 400R Plus. You can buy it online at http://www.amazon.in/VIP-400R-Super-Silent-Supply/dp/B00S60IFHQ/?tag=aksha0b-21 because it is hard to find in local stores. Which will be a better buy? Of course, I will be buying it from local market only, not from Snapdeal. I want to inform you that for NAS Server, I have finalized Corsair CX600 V2. Which are cheaper brands besides VIP? Hard to get them from local market. Would not recommend any brand lower besides VIP because they all are crap. Then go for VS350 only. Thanks for the reply. I will try to get VIP brand SMPS from local market. Lets see what do I get? But local vendors are of opinion that they are not well supported, if anything goes wrong. I will find out more. Yes there support is limited but they are good. And please share this blog with your friends so that i can help others too in this field. Definitely I will share this blog and will discuss with your more about technical topics. You definitely provide us very good information. You are always welcome and i am here for any hardware related queries. I have tried to purchase Corsair CX 600 V2 as suggested by you for my NAS with 7 HDDs. In the local market there is a model of Antec Neoeco 620C available. Will it server the purpose as compared to Corsair 600 V2. Is it graded above Corsair CX 600 V2 model? Will it support 7 HDDs running 24 x 7? Antec NeoECO 620C is even better. Go for it. I will go for Antec Antec Neoeco 620C for my NAS. I have bought a Corsair EcoNeo 620C. Its running wonderfully well with 5 HDDs. You are always welcome Mukul. I have one request from my side, please spread the word about my blog to your friends and others. Motherboard : zebronics nvidia nf-7050 motherboard nvidia geforce 7050 / nforce 610i 256mb onboard graphics. Also please suggest me any other powerful processor that can fit in my board and available in market ? E8400 is a major improvement over your current processor and i think it will help your with higher bitrate videos. If you really want a powerful processor for LGA 775 socket then do look for Q9550. It is a quad core processor clocked at 2.83 GHz and will give you performance equivalent to an older i5. One important thing to note is to check your motherboard manual for supported processor types before making any purchase because even though the processor has same socket type, some motherboards refuses to support newer LGA 775 processor models. i think it supports E8400.Please check the link and confirm me but it comes as Refurbished state.IS it ok ? i can’t find q9550 neither online nor shop since it is old. It is just written Core 2 Family and not about models. So consult your motherboard manual to be on safer side. Refurbished Processors works good if you get it from a good seller. I have also used refurbished processor and its working fine. 3. bus speed.what is the order of preference to get better performance? Some friends told me that my board supports upto 2MB cache .is there anything like that? None of them in the first place. The most important thing is the processor architecture and number of cores. Then comes these things that you have mentioned. Processor cache has nothing to do with the motherboard compatibility. for example :3M Cache, 3.06 GHz vs 4M Cache, 2.66 GHz which is better? so hoping core2family includes E8400, gonna try it. Without processor model and architecture it is difficult to say, but here i would prefer the one 4M cache and then overclock it to run at 3.0 GHz. This is because you cannot increase the cache but you can increase the frequency by overclocking. Thank you once again for your wonderful help .now got some basic understanding while choosing processor. As i told earlier i am gonna upgrade to i7 nearly after 6 months but for immediate use i need good processor. Earlier i choose Intel Core 2 Duo E8400 3.0GHz Processor 6MB cache 1333MHZ cost around rs.900. Do i go with E8400 or E8500? If you are going to upgrade your PC in 6 months then no need to spend too much money. You should be fine with E8400 as it should offer you the performance you need temporarily. They are not good. Not Recommended by me. You will need around 750W SMPS. I recommend you to get Corsair CS750M. Thank you for your suggestion. I will abide to it. However I have another query regarding the UPS. I feel it is as important to have quality UPS as to have a quality SMPS when the stakes are as high as 750W. Do you recommend any particular brand for UPS? Do you have any article as this post on UPS selection. I recommend APC UPS. You can refer these articles. If you have any doubts in choosing a UPS then you can ask me. For my home PC I need to purchase a SMPS. I dont plan to attach a graphics card. Although, there will be a couple of PCI cards attached to it. The board will be a low power board Intel Atom processor series Celeron. Request you to kindly suggest a power supply. I am planning to prepare a low power Open Source Router Firewall which will run 24×7. My budget range is Rs. 1000 to Rs 2000. I suggest you to go for Corsair VS450. It will cost a bit more at 2.4k but is worth it. Yes it will work too. In branded Cooler Master Elite 110 cabinet is very good. Are there any which I can mount in 19″ rack? Well I don’t remember anyone right now. have to search it. I will be alright but it should be better if you have got 1000VA UPS for a 650W SMPS. This Corsair VS650 SMPS will be more than sufficient for your PC. As suggested by you I have purchased a Crossair VS 450 SMPS from Amazon for Rs 2550/- and now my cabinet has only space in the top to fix the SMPS and the purchased Crossair VS 450 SMPS has a fan on the top. Please suggest how do i fit into the present cabinet which is of mercury make. The fan goes in the bottom and not on the top. After that you can fix it like a normal smps. Please suggest looking for good SMPS for my desktop for home use only iam having gigabyte mother board 32 0 GB HDD intel core 2 duo E7400 & 2gb ram recently my iball has malfunction. Hello! My name is KIRAN. I want to build a new PC. So which SMPS & CABINET should I go with? Do reply as soon as possible. How much is your budget for SMPS and Cabinet? Does the Corsair VS450 SMPS support Intel’s old motherboard 915GAVL. As, I feel my Mercury 400 Watt SMPS is causing problem for my PC. I want to build a PC for a very light work. The motherboard is old one supporting Intel Core 2 Duo. No plans for Graphics card and Optical drive. Intel Core 2 Duo Supported Motherboard. Kindly suggest a suitable motherboard. Go for Gigabyte GA-G31M-ES2L motherboard. for power supply go with VIP 400R Plus. Are Artis power supply same as VIP Power Supply. I have seen Artis VIP400GOLD 400 Watt SMPS Power Supply Unit on Amazon. I have use Pt IV . D945GCNL, i have use I Ball SMPS. Problem is when i on External Speaker my CPU is Off & restart again. its make some Noice from Fan. Could you please advise some best option for this problem. 01 more problem is when electricity fluctuation my system is restart automatically. I have my change my UPS (now Micro tech) but problem is not solve. I did not get you clearly. please explain in detail. hello akshar ji , nameshkaar.. sir meri kuch help kijiye, meri do hard drive kharab ho chuki hai, achanak se kaam karte karte hang ho jata hai pc or fir message show hota hai ke disk boot failure, or kabhi kabhi achanak se blue screen aa jati hai, re start karne par disk boot failure aata hai ya fir dobara se theek chalne lagta hai.. ye hote hote meri do hard drive kharab ho gayi, to muje laga shayad drive change karni chahiye main new le kar aaya usmein bhi same problem face kar raha hoon… samaj nahi aa raha problem kahan hai drive main hi hai ya power supply ki wajah se ye ho raha hai, mera old computer hai, configration iis parkar hai… motherboard : G41 m combo , processor : core 2 quad Q96550 , 2 gb nvidia graphic card, and one creative sound blaster card , 4 gb ddr3 Ram, 500gb sata hdd, SMPS : Intex smart ATX Switching power supply, Ac input : 220v 50HZ 5A …. kya muje smps badal kar dekhna chahiye…?? Yes you must change your SMPS. I suggest to go for Corsair VS450.